One of Comhan Holland’s many indoor tensioning systems is a lightweight sliding-door frame system called T-Door. 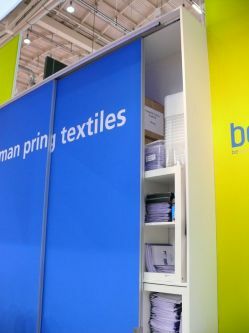 The quick and easily assembled design has a variety of applications such as; exhibition stands, screening/separation in showrooms, warehouses, storerooms, retail displays, and other interior applications. The frame utilizes anodized aluminum and accommodates graphics on textiles or on printed Dibond aluminum composite sheets. While the standard door length is 20 feet, it can be cut to accommodate customization. Although Dibond has been used in numerous interior applications, its ability to be used in a sliding door application is unique.